LOASA (Learning Outcomes in Accordance with the Skills Agenda) is a new partnership between the world of work and education that aims to bridge the skills gap in Europe. 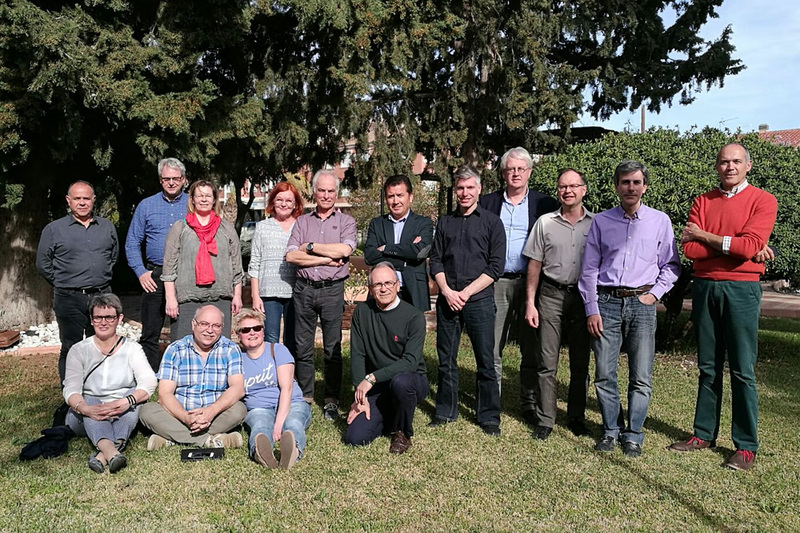 Here is a brief summary of the Erasmus+ KA2 project. There is a huge gap between supply and demand of skills in the labour market in Europe. It is expected that is gap will continue to grow over the next years, especially in the green sector. Many current jobs disappear and new jobs that do not yet exist will emerge. The Fourth Industrial Revolution is about to create a shift in the skill sets required of workers in green jobs. These expectations are based on research including Cedefop, 2015: ‘Skill shortages and gaps in European enterprises’; International Labour Organization, 2014: ‘Skills Mismatch in Europe‘; World Economic Forum, 2016: ‘The Future of Jobs‘; 2016 European Semester of the EU’s growth strategy ‘Europe 2020‘). 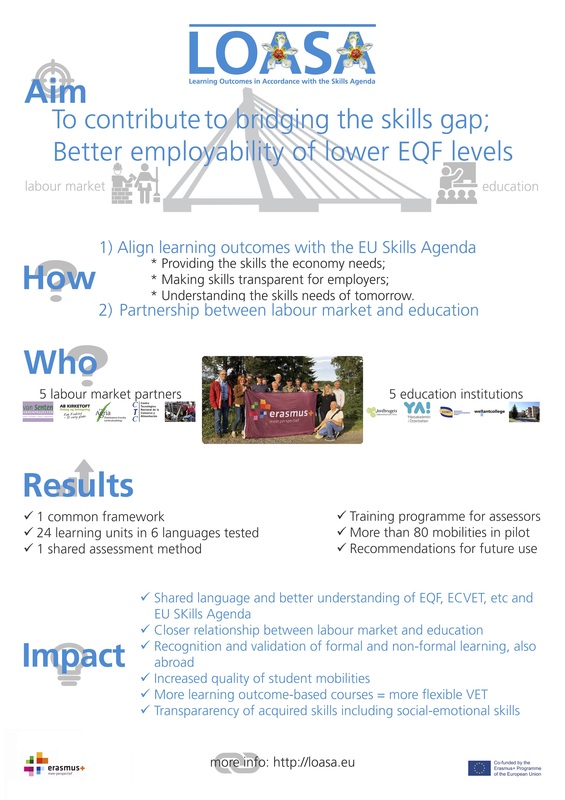 The aim of this project is to reduce the skills gap in the labour market and increase the employability of workers by contributing to the three main topics of the New Skills Agenda for Europe and further develop this agenda. To make this happen, five education institutions from four different EU countries have teamed up with five partners representing the industry (companies, branch organization, cooperative, etc) to co-develop a framework for units of learning outcomes that are based on ECVET principles and align with the New Skills Agenda for Europe by embedding generic skills, professional skills and social-emotional skills. Employers who need transparency of skills. Students and employees will engage more actively in international mobility programs, thus increasing their awareness and understanding of their own capabilities and the opportunities on the labour market. This leads to an increased employability. The companies will use the units of learning outcomes and the assessment tools to keep track of the development of their employees. This helps them in strategic planning, HRM, and team development of their companies. Branches will demonstrate their role as a supporter for the green sector in innovation and can prove to be the ideal partner to disseminate the outcomes to the whole sector. For the VET institutes the units of learning outcomes and the taxonomy of Dee Fink are a starting point to further develop and implement the learning outcome approach in accordance with the needs of the labour market in their education. Teachers will have first-hand experience of what intrapreneurial behaviour in companies means and will be more aware of their own capabilities. LOASA partners will have a better common understanding of what working with the New Skills agenda for Europe means and how to cooperate in developing those skills. Find us from Facebook, from Instagram, from Twitter and from Youtube.